Hey guys! I hope your well and smiling. 2 posts in one week – I’m doing pretty good right? So I recently discovered Zaini and they sell the most trendy and comfortable looking hats, neck warmers and headbands. I really wish I had one to keep me warm during this weather – hence why I’ve done a wishlist. 1. Lomond Hat – If you follow me on Instagram Yo will know that I’m really loving black at the minute and this is a reason why I’d love to have this it’d match my wardrobe so well. 2. Jura Hat – I love pink as you all know,but this blue compliments the pink so well I love it. 3. Scarba Hat – I think blue and winter make a perfect match so this would be super cute. 4. Angus Hat – All the colours combined in this hat are super classy and you could rock this hat with nearly any outfit I love it – it’s new in too,so it’s trendy!! 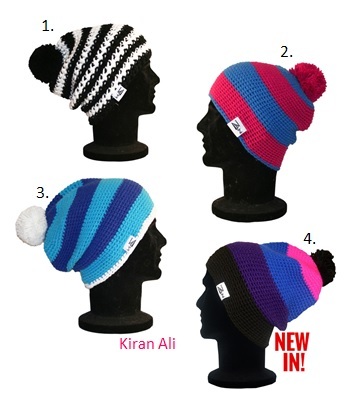 Tell me your favourite hat on the Zaini website in the comments below. I think I might go purchase one to keep me warm too. Like your picks, I also picked the black and white one!